Henry Foster was born on the 26th February 1896 in Nottingham the eldest son of Henry Foster (c1873-1949), a printer, and his wife Annie (née Norman, c1872-1960). All five of Henry and Annie's children2 were born while the family was living in St Annes, Nottingham3 but, sometime before 1911, thay had moved to Beeston where they first lived at 16 The Poplars4 before later moving to 37 Gladstone Street. After school, Henry junior first followed his father into the printing trade but later took a labouring job at Ericsson Telephones. 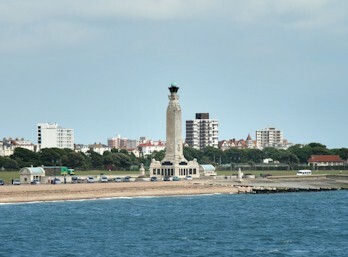 In June 1913, he decided to leave this behind and to join the Royal Navy, at first as a Boy Seaman5. After basic training at Devonport, he served on HMS Implacable and HMS London and, after enlisting for 12 years on his 18th birthday in February 1914, he became an Ordinary Seaman on board the armoured cruiser HMS Black Prince (shown right)6. In the early part of the War, Black Prince was one of four armoured cruisers with 1st Cruiser Squadron, part of the Mediterranean Fleet, and took part in the pursuit of two German ships, Goeben and the Breslau. After they escaped to neutral Turkey, Black Prince, along with Duke of Edinburgh, searched the Red Sea for German merchant ships and succeeded in capturing the German ocean liners Südmark and Istria. In December 1914, Black Prince joined the Grand Fleet, the main fleet of the Royal Navy at that time, and was assigned to 1st Cruiser Squadron under Rear-Admiral Sir Robert Keith Arbuthnot. Ordinary Seaman Foster was promoted to Able Seaman at this time. The Grand Fleet was based first at Scapa Flow and later at Rosyth and, took part in the Battle of Jutland under the overall command of Admiral Sir John Jellicoe, against the Imperial German Navy's High Seas Fleet under Vice-Admiral Reinhard Scheer. It was fought in the North Sea, near the coast Denmark's Jutland Peninsula and was to be the largest naval battle and the only full-scale clash of battleships in the War6. The German commander had planned to lure Vice-Admiral Sir David Beatty's battlecruiser squadrons, consisting of six battlecruisers and four battleships, into the path of the main German Fleet and attack them with waiting submarines. 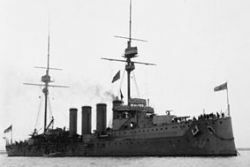 However, this became known from signal intercepts and Jellicoe sailed with the Grand Fleet on 30 May 1916 to rendezvous with Beatty. But, before this, on the 31 May, Beatty encountered Vice-Admiral Franz Hipper's battlecruiser and was drawn into the path of the High Seas Fleet and two British battlecruisers were lost before the German fleet was drawn towards the British main fleet. In the engagements that followed - involving 250 ships between the two sides - a further twelve British ships and eleven German ships were sunk, bringing the total British killed to over 6000 and the German killed to over 2500. HMS Black Prince was part of 1st Cruiser Squadron, a screening force positioned several miles ahead of the main part of the Grand Fleet but had lost contact with the rest of the Squadron when it encountered German forces. Although contemporary accounts were inconclusive, recent research appears to show that, now alone, Black Prince had briefly engaged the German battleship Rheinland, scoring two hits with 6-inch shells before turning away from the overwheming German force. But it was too late as she was caught in searchlights and attacked by up to six German ships, hit by at least twelve heavy shells and several smaller ones. She sank within 15 minutes with all 857 on board - including Able Seaman Foster.